Taiwan was denied access to a United Nations meeting on civil aviation beginning this week, the latest evidence of Beijing’s efforts to put pressure on Taipei’s new government. The International Civil Aviation Organization, or ICAO, has not invited Taiwan to a triennial meeting in Montreal, Canada, beginning Tuesday, Reuters first reported, despite a plea from Taipei to participate in the meeting in order to ensure civil aviation safety. Taiwan was invited to participate as a guest at the 2013 meeting as a result of a compromise between China, the United States, and other members of the U.N. specialized agency. However, a representative for ICAO told Reuters last week that the arrangements of this year’s 39th assembly did not follow those of 2013. "ICAO follows the United Nations’ ‘One China’ policy," Anthony Philbin, ICAO’s communications chief, said. "While arrangements had been made for their attendance at the last (38th) session of the assembly, there are no such arrangements for this one." Taiwan’s Mainland Affairs Council said it approached China on the issue in August but was "flatly rejected." The council in a statement called on China "to open its heart and think seriously as it may face serious consequences for its one-sided actions." A spokesman for the Chinese Foreign Ministry, meanwhile, described Taiwan as an "inseparable part of China" that thereby has no right to participate in the triennial meeting. "At present, our position is extremely clear. The prerequisite for Taiwan to participate in any international activity is for it to agree to the ‘One China’ policy and for this to be resolved through consultation," spokesman Lu Kang told reporters. The decision comes months after Taiwan elected a member of the Democratic Progressive Party that traditionally favors ultimate, formal independence from China, as its president. 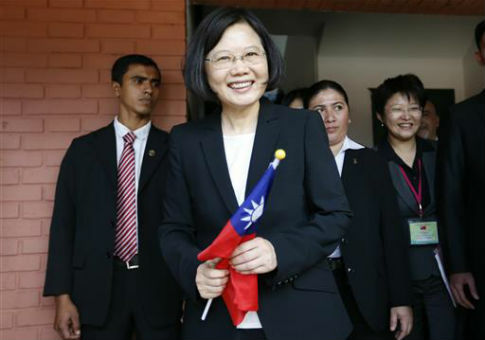 Tsai Ing-wen, Taiwan’s first female president, drew criticism from Beijing earlier this year when she did not affirm the 1992 Consensus in which Taipei and Beijing agreed that they were part of "one China," a phrase that both sides have interpreted differently. China suspended diplomatic contact with Taiwan in June. "Taiwan did not receive an invitation for the 39th assembly of ICAO, and we wish to express our strong dissatisfaction and regret," Tsai said on Friday. "This is extremely unfair treatment, and a loss for international flight safety." Kolas Yotaka, a Taiwanese legislator and member of the Democratic Progressive Party, visited Washington, D.C., earlier this month to highlight Taiwan’s desire to expand its participation in international organizations, telling the Washington Free Beacon that being invited to ICAO would serve as a stepping stone to joining organizations like the United Nations and the World Health Organization. The U.N. recognizes "one China" as centered around Beijing. On its current aviation statistics, ICAO also lists Taipei Airport as located in "Taipei, CN," or in mainland China. The U.N. agency previously designated the airport as located in "Taipei, TW," the latter denoting Taiwan. The United States switched diplomatic recognition from Taipei to Beijing in 1979. Still, the U.S. maintains a "robust unofficial relationship" with Taiwan and the Obama administration has welcomed Taiwan’s participation in multilateral organizations for which statehood is not a requirement for membership. President Obama met with Chinese President Xi Jinping in Hangzhou, China, ahead of the G-20 Summit earlier this month to formally agree to the stipulations of the Paris climate accord. It is unclear whether Obama broached the subject of Taiwan’s participation in the ICAO assembly during the meeting. "We would like to see Taiwan’s meaningful participation in ICAO," Daniel Russel, the State Department assistant secretary for East Asian and Pacific Affairs, said in New York on Friday when asked about the decision not to allow Taiwan admittance to the assembly. "Aviation safety, aviation security, aviation efficiency are matters of importance to all of us, and we think all interested stakeholders can play a positive role in ensuring that standards and regulations are met around the world." "We have an abiding interest in supporting Taiwan as it seeks to expand its already significant contributions to addressing global challenges, and we have an abiding interest in cross-strait dialogue, cross-strait stability, cross-strait peace where there are steps by either side to reduce tensions and to foster constructive dialogue and engagement," Russel continued. Taiwanese officials are still planning to go to Montreal to attend bilateral meetings but will not attend the assembly. Russel would not say whether U.S. officials would participate in the meetings. This entry was posted in National Security and tagged China, State Department, United Nations. Bookmark the permalink.